Back in my mispent youth I learned how to run the old Coates and Bishman tire changers, and as such it always pained me to pay for a service I could perform myself. But even the entry level power tire changers run in the thousands, kinda hard to justify for a handful of tire swaps a year. And given that Costco is willing to mount & balance the car tires for $15 a pop, no point in dirtyin’ my mitts. But motorcycle tires are another matter, with too many of the local shops open banker’s hours and charging bank robbery prices on tires and mounting. So I had a fling with a harbor freight changer a few years back, only useful bit of it was the long mount/demount bar, the rest is stowed away somewhere that I won’t have to look at it. At times I’ve resorted to low tech… A pair of two foot long tire irons from the farm store. Worked OK with the traditional 90 to 120 mm. wide tires found on airheads and such, But then a Buell with 120/70 Z rated tires entered the fleet, and after one wrestling match with one of those I surrendered and subbed out the tire work to the pros. Having moved outa the big city, the local Guzzi/Suzuki dealer gives me reasonable pricing, but often they’re busy or out of stock and it takes a week or two before my baby can get new shoes. When you’re a cheapskate like me who looks at the worn tires and thinks “good for a couple hundred more miles, let’s ride!” and wears them to the point where the grooves can not be felt, never mind seen, having a tire changer in the shop is a good thing. So I blew last months $800 budget surplus on a NoMar Classic tire changer and accessory bits. 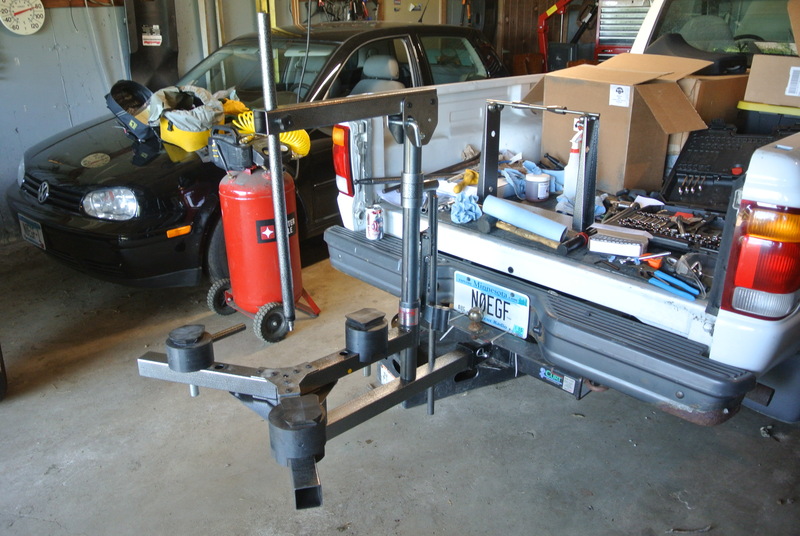 So the other day I unboxed the new toys and mounted the changer on the convenient 2″ hitch mount. The assemblage included the structure to reputedly hold the wheel, a mounting bar with nylon tips, three “3rd hands”, a yellow rim gripper thing, a wheel balancer with lifetime supply of wheel weights, and sundry other bits. Missing was much in the way of instructions, they mostly having been dumbed down to a video for the barely literate U-tube generation who struggle with big “words” like “OMG”. Having read the spotty two sheets of written instructions and watched the video, I took on the 16 inch Spyder sidecar wheel for practice. After an hour or so of trying to follow what I could remember of the instructions (videos don’t exactly lend themselves to paging through them on the shop bench to find an answer) I laid the wheel down on the floor and with the good ol’ tire irons finished the job. The wheel balancer however was a joy to use, a real quality piece that quickly finds the heavy spot and lets you balance it with the plentiful stick on weights. So today I gave it a different challenge and a second chance mounting a new 150/70-17 on the Super Tenere. The wider 17 inchers have tough carcasses and are a real challenge, and the No Mar changer isn’t quite up to that challenge. While No Mar promotes their locking blocks as near bulletproof, they wouldn’t securely hold the 16 inch wheel and stood up too high to lock onto the 17 inch wheel until I had the tire demounted. So back to the floor and tire irons. Lock up the now bare rim and it held, but even with a hearty helping of No Mar’s grease the new tire couldn’t be fully persuaded onto the rim… Tire irons to the rescue again. Tire in place, it aired up with no drama on the relatively narrow rim. That 150 mm. tire and narrow rim may be the problem… The No Mar changer and bits seem to be sized for the wider 180 mm. tires and five and a half inch rims common on sports bikes these days. ‘Tis a shame the basic design falls short, because the 3rd hand and yellow thing are truly useful bits. That said, I’m not going to box it up and send it back just yet- No Mar is supposed to be at the MOA rally. If the MOA don’t throw me out, I’m gonna talk it over with them and ask that the show me how to mount something other than squid size tires on their changer… Expect a follow up report. Hello, From No Mar Tire Changer. I wondered if you could give us call. I read your post here, and noted from your picture noticed you do not have a key Accessory for your changer that would change your problems you are having. I watched your tire techs mounting tires at the MOA rally and saw that they were having the same problem with the narrower rims. I brought this up in discussion with you folks and you suggested I needed the posi-clamps. Having already spent $800 on the tire changer and accessories, I’m in no mood to spend another $150 on adapters that should have been included in the product in the first place. I think you have a good product for changing tires on wider wheels, but you really need to be more upfront about the limitations of your changers with other wheels.